As New York Yankee fans watch their over-paid team being dismantled by Tiger pitchers, the Cardinal clan of St. Louis continues to ride the wild card express to another possible World Series. The second in as many years… What’s up with these guys in October? Carley, doing a little soaring also, has just published the second in the Metal Man Walking series titled, Annie Dreaming. Here’s a preview and link… take a look. The eighth chapter of Hosea was on tap from the pulpit of Lighthouse yesterday where our Pastor revealed Israel’s confidence… where they found their assurance. I can’t quite put my hand on it, but this list sounds eerily familiar. When confronted by the command to ‘blow the trumpet’ for judgement was coming by the hands of a foreign nation, Israel thumbed its nose toward the warning, finding security in their political system, their military, and their religion. It’s always good to remember that an angry God’s wrath was satisfied on a cross nearly two thousand years ago as Jesus took our place and paid our debt. It’s equally urgent to realize that those who receive the grace and mercy afforded us at Calvary have entered into a covenant with God similar as Israel did. How does God respond today when His people, His Church, or a nation dishonors Him? 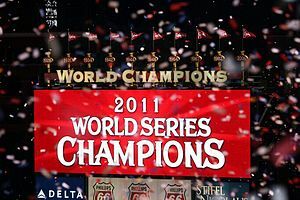 This entry was posted in WordPosts and tagged 2012 World Series Champions, Christinaity, God, Hosea, Israel, Jesus, St. Louis Missouri, World Series. Bookmark the permalink. The God of the Old Testament is one of the arguments put up against Christianity, and I have to agree that a God who orders all men, women, children and animals to be slain does not align with the loving God I have known for the last 54 years. I think the answer is found in your previous para: >> “an angry God’s wrath was satisfied on a cross nearly two thousand years ago as Jesus took our place and paid our debt.” God’s wrath on sin was indeed poured out on Christ and that act ushered in the age of Grace. Is God still the same God? Of course He is! Was He unjust in the OT? No way! Will God again show Himself the same as He did in the OT? There will be NO WAY to ESCAPE the WRATH of God. Yes, you are absolutely right good friend. God’s warnings are in fact a magnificent demonstration of His love, mercy, and grace. The justness that His holiness demands is spoken endlessly to His creation… with one intent, that His people would come to Him… to escape His wrath. His love is so great that provided that pathway into His presence by remaining just and becoming the justifier of His own. Same God, revealed perfectly in His Son, Jesus Christ.